Triveni EC is pleased to report that more than 150+ members attended Yugaadi celebration on April 18th, 2015. We would like to thank all of you who came in such good numbers and helped us in the success of this event. We welcome new & old members to the Triveni family and look forward to your active participation in Triveni programs. We would like to thank all the performers who worked so hard and put up a beautiful show. 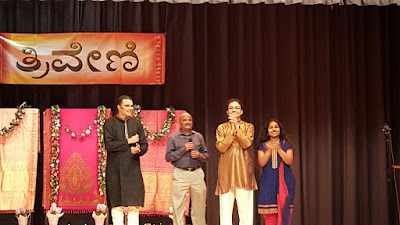 We received many positive comments about the variety and quality of the performances. * Amazing “Chitrmanjari” and DOLu KuNita programs by our sister association” NavOdaya”. * A very inspirational, scholarly, informative & humors Yuggdi slide show presentation by Dr. Yalleshpur Jayaram. * Music always speaks what we cannot be expressed, smoothes the mind, heals the heart & makes it a nice flow; that’s exactly what all the members felt by listening “Music SPeaKS”. What a great name for great group of entertainers!!! The day’s program was superbly & smoothly conducted by Poornima Nayaran and Manasi Gopal; MC s’ of the day. Our warmest thanks to all these participants for their excellent performances. We would also like to extend a grateful thanks to Prathiba Keshavamurthy for organizing amazing programs by NavOdaya; Poornima & Manasi who conducted the day’s proceedings with wit and charm; Triveni Annapurnas “Anna Danam Maha Danam” for making delicious dinner . We received many positive comments about the variety and quality of the performances. A number of you expressed your appreciation, made many positive comments about the program, and encouraged the artists & EC committee by recognizing their dedication and hard work. These are the fuel which keep the spirit of the artists and the organizers high and help bring you high quality programs. We thank you for your kindness and generosity. We would also like to thank the Demasi Middle School authorities for their excellent facilities and Tom Hilferty for his outstanding support with technical needs. We received outstanding help and support from so many volunteers in all areas including sound management, registration, decoration, snack and dinner set up, equipment transportation, and whatever else was needed to run the event successfully. Our heartfelt thanks to all these volunteers; we could not have done it without your help. I want to personally thank committee members & their family for their hard work, commitments and sacrifices. Last, but not least a very sincere thank you to all the attendees; you are responsible for the day’s success! Without your continued support, we would never be able to put on events like these, so thank you. With your help and support, we are confident that we can take Triveni programs to greater heights! Our EC team is dedicated to involve, motivate and encourage Triveni’s youth and members as much as possible during our programs. We are requesting all the parents of youngsters encourage their children to get involved with activities and also we encourage all of you to actively participate in whatever capacity you are able. We have need of whatever time and talents you can contribute. This is your Triveni: with your help, support, and attendance to the programs, we are confident that it will grow to greater heights! Our future programs are Picnic/Walkathon, Ganesha and Deepavali. we will keep you posted.